If you are looking for authentic Italian Fresh Pasta - Pasta Fresca - look no further. We make our pasta fresh weekly using solid brass dyes that impart a rough texture to the pasta that allows it to hold the sauce. Dried boxed pasta is made with teflon dyes that leave a smooth surface that does not hold the sauce. Our free-range hens contribute the eggs to make the pasta more flavorful and nutritious. Pasta is made fresh weekly and delivered the following day. Many varieties are available including: bucatini, angel hair, linguine, gigli, fusilli, conchiglie, pappardelle and others. Pricing is affordable for a premium fresh product. 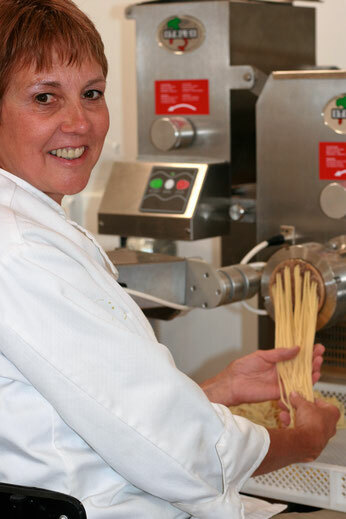 ENHANCED PASTA: We enhance the pasta with produce grown organically on the farm. Spinach, basil, and kale are added on a seasonal basis to make it even more pleasing to the eye, the palate and the nutritionist. COOKING TIPS: Remember, fresh pasta cooks faster than boxed dry pasta - don't overcook it! To cook - add a pinch of salt to boiling water - then add the pasta, teasing it apart and boil for 1-2 minutes per package instructions. Serve with your favorite sauce. Alternatively, cook for half the time and add it right to the sauce on the stove to finish cooking and fully absorb the flavor. Buon Appetito! Farm sales daily but connect with us before you come so we will be sure to be here.